Since the beginning of the electrical age, copper wire has been recognized for its unique and beneficial qualities in electrical applications. Of all the metals copper is after silver the second best conductor of electricity and heat. 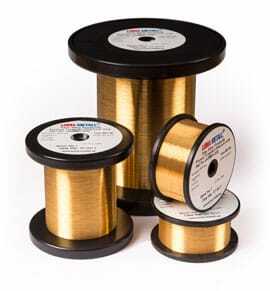 We now also offer gold plated copper wire. Gold plated copper wire is a malleable and ductile material with excellent conductivity. To ensure a good adhesion of gold, our round gold plated copper wire is supplied with a nickel strike in between the copper wire and gold. Our plating technology secure a uniform coat thickness and the coat thicknesses of gold and nickel can be adjusted to meet your requirements. At Luma Metall we design and build our own plating equipment. Copper wire is not redrawn at Luma Metall. You are welcome to send your own material to us for plating, or let us arrange material for plating. Luma gold plated copper wire is available in the dimension range 0.050 – 0.3 mm (0.00196 – 0.0787″).